5:48pm: Los Angeles will take on $3.6MM of Martin’s salary, with the Jays paying the other $16.4MM of what’s still due, per Ben Nicholson-Smith of Sportsnet.ca (Twitter link). 1:30pm: The Blue Jays have formally announced the trade. They’ll send Martin and cash to Los Angeles in exchange for minor league shortstop Ronny Brito and minor league right-hander Andrew Sopko. 1:12pm: The Dodgers have reached an agreement on a trade with the Blue Jays that will bring veteran catcher Russell Martin back to Los Angeles, reports Arash Madani of Sportsnet (via Twitter). Martin will earn $20MM in 2019 — the final season of a five-year, $82MM contract with the Jays. Presumably, Toronto is paying down a hefty portion of that remaining salary as part of the trade. The addition of Martin shouldn’t strictly take the Dodgers out of the running for Marlins star J.T. Realmuto, though there’s certainly less urgency for Los Angeles to meet Miami’s lofty asking price with this deal in place. Still, it’s not inconceivable that president of baseball operations Andrew Friedman could make a strong offer for Realmuto even with Martin and Austin Barnes on the roster. Barnes has a minor league option remaining and is capable of playing the infield, and some reports have indicated that Miami would like a catcher with MLB experience as part of a Realmuto deal (in addition to multiple top prospects); Barnes could fit that description, speculatively speaking. Soon to turn 36, Martin will bring a keen eye a the plate and strong defensive skills to the Dodgers, who of course originally drafted and developed the four-time All-Star. While last season’s .194/.338/.325 batting line obviously looks ugly, Martin walked at a nearly 16 percent clip, one of the highest rates in the league, and demonstrated that he still has a bit of pop — certainly enough to make him comparable to other catchers throughout the game. Martin hit 10 homers and recorded a .133 ISO (slugging percentage minus batting average), the latter of which checked in only slightly south of the mark of a league-average catcher (.141 ISO). Martin did hit the ball on the ground (51.2 percent) and pop up (19.4 percent of his fly-balls were pop-ups) at career-high rates in 2018, so the .234 average on balls in play he posted last season may not be as much of a fluke as it would seem at first glance. But, if he’s able to correct either of those issues in a return to Chavez Ravine, he’ll give the Dodgers a high-quality defender with excellent on-base skills. Martin’s caught-stealing numbers have dwindled recently (22 percent in 2018), but he remains a premium pitch framer and was among the best in baseball at blocking pitches in the dirt, per Baseball Prospectus’ metrics. 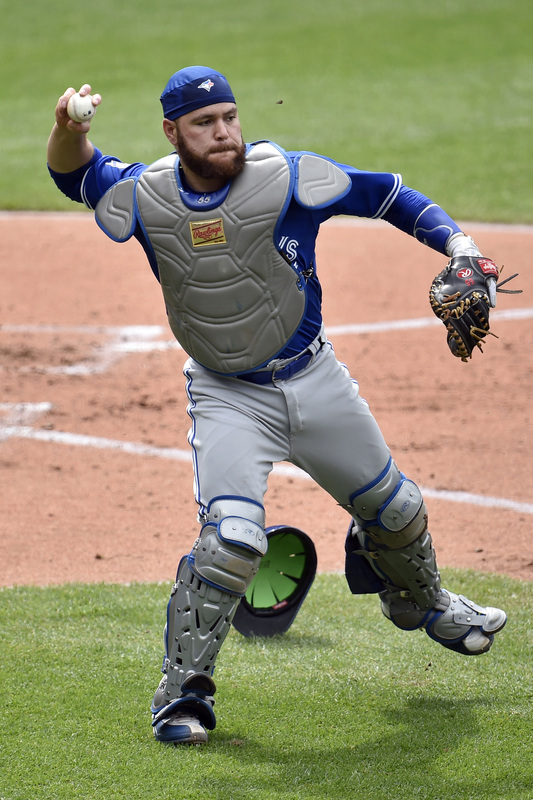 The trade of Martin to Los Angeles will open the door for Jays catching prospect Danny Jansen to audition as a long-term piece behind the dish. The 23-year-old Jansen has long rated as one of the organization’s better prospects and enjoyed a solid late-2018 debut with a .247/.347/.432 slash and three homers in 95 plate appearances. Jansen will team with 27-year-old Luke Maile, a strong defensive backstop who had a career-best .248/.333/.366 batting line in 231 plate appearances last season. Brito, 20 in March, signed with the Dodgers for a $2MM bonus as a 16-year-old amateur and has yet to ascend beyond Rookie ball. He split the 2018 season between the Dominican Summer League (eight games) and the Pioneer League (53 games), posting a combined .295/.359/.496 batting line with 11 homers and 14 doubles in 262 plate appearances. He’s quite a ways from big league relevance, but he did enjoy solid production against older competition in the Pioneer League this past season. Sopko is a 24-year-old righty whom the Dodgers selected in the seventh round of the 2015 draft. He opened the 2018 season at Class-A Advanced and ascended to Double-A midway through the season. Between those two levels, Sopko notched a 3.52 ERA with 9.3 K/9 against 2.1 BB/9 and 1.1 HR/9. As a fly-ball righty with a low-90s heater who relies on control, his realistic ceiling is more along the lines of a back-end starter, but his success in Double-A means he shouldn’t be too far from getting a look at the big league level. The Athletic’s Jayson Stark (subscription required) has delivered his traditional year-end rundown of some of the weirdest stats and moments from the past baseball season. Stark’s piece covers such oddities as Adrian Beltre’s eight straight seasons with exactly one stolen base, Framber Valdez’s oddly similar first two MLB starts, the Pirates pulling off a 1-3-4-2-5-8-7 double play, and how Juan Soto’s first career homer shattered the space-time continuum. Though the Astros have been linked to several first base/designated hitter types this winter, The Athletic’s Jake Kaplan (subscription required) notes that the team could be in good shape as it stands by having Tyler White get a regular share of DH at-bats. White posted a .276/.354/.533 slash line over 237 PA last season, and he could join with the Astros’ left-handed outfielders (Michael Brantley, Josh Reddick, or Tony Kemp) in a timeshare at DH to keep everyone fresh. However, Kaplan also feels Houston will need to move an outfielder before Opening Day to alleviate a playing time crunch, which means that Kemp, Jake Marisnick, or possibly top prospect Kyle Tucker could all be trade candidates. There were also some rumblings about Reddick on the trade market last month, so it could be that Brantley and George Springer are the only two untouchable outfielders on Houston’s roster. Kaplan’s mailbag piece is well worth a full read, as it covers several other topics about the Astros’ offseason and potential long-term moves for the club. Pirates catcher Francisco Cervelli and Blue Jays catcher Russell Martin are both generating some degree of interest on the trade market, per Jeff Passan of Yahoo Sports (all Twitter links). The Jays are willing to pay a “significant” portion of the final $20MM on Martin’s contract, per Passan, and have already discussed him with other clubs. Cervelli’s on-base skills are also appealing to catcher-needy teams, Passan notes, and the Pirates are willing to listen to offers for the veteran backstop. Both players are entering the final season of multi-year contracts. Cervelli, 33 in March, just wrapped up a vastly superior offensive season to Martin and is owed a more palatable $11.5MM in 2019 before reaching free agency next winter. That price point is obviously steep for the typically low-budget Pirates, but other clubs around the league may not consider it excessive for a player who hit .259/.378/.431 with a career-high 12 home runs in 404 plate appearances last season. That OBP is hardly anything new for Cervelli, who has reached at a .370 clip or better in five of the past six seasons, with a .342 mark in 2017 serving as the lone exception. Cervelli also halted an outstanding 39 percent of stolen-base attempts against him, though his once-superlative framing skills have checked in below the league average in each of the past two seasons, per Baseball Prospectus. He also rated below average in terms of pitch blocking in 2018. The 35-year-old Martin is in a much different spot. He’ll make $20MM in the final season of a backloaded five-year, $82MM contract next season, and while his 15.9 percent walk rate was sensational, his overall .194/.338/.325 batting line leaves plenty to be desired. Martin was undoubtedly harmed by a .234 average on balls in play, but that’s perhaps not as unlucky as some might think at first glance. While that .234 mark is well south of his career .283 BABIP, Martin saw his line-drive rate drop by nearly 10 percent this past season — from 23.7 percent in 2017 to 14 percent in 2018. He also posted a career-worst 19.4 percent infield-fly rate and hit the ball on the ground at a career-high 51.2 percent clip. For a 35-year-old catcher whose once-surprising speed has largely evaporated, that’s not a great trend. Defensively, Martin’s once-excellent caught-stealing rate has waned over the past three seasons (22 percent in 2018 — six percent below the league average), but Baseball Prospectus still grades him as a premium framer and blocker. The availability of both Cervelli and Martin only further adds to a market that has a vast supply of options but also a rather substantial amount of demand. Marlins star J.T. Realmuto is obviously the prize of the catching class but also surely comes with a substantially greater cost of acquisition than either Cervelli or Martin. Cleveland’s Yan Gomes, too, is said to be available. Free agency, meanwhile, offers the likes of Yasmani Grandal, Wilson Ramos, Martin Maldonado and Robinson Chirinos, among others. As for demand, there’s no shortage of contenders or hopeful contenders who could use upgrades. The Dodgers, Astros, Rockies, Angels, Twins, Red Sox, Mets, Brewers and Phillies could all conceivably explore the market, as could a number of teams that are either in the midst of a rebuild or retooling process (e.g. Mariners, Tigers). And, of course, if any of Cervelli, Martin or Realmuto is moved, those catchers’ former clubs could look to the market to add a replacement option at a lower price. Russell Martin reflects on a tough year in an interview with Sportsnet.ca’s Jeff Blair, and needless to say, the veteran catcher is hoping for better things in 2019 for both himself and his team. Martin hit just .194/.338/.325 over 352 plate appearances this season, an unimpressive slash line that could end up being his final number, as Martin has barely played in September due to the Jays’ desire to give playing time to younger catchers Danny Jansen, Luke Maile, and Reese McGuire. Martin has seen additional time at third base this year and even performed spot duty as a shortstop and left fielder, though in regards to his future as a catcher, “I’d like it to be a competition and force [the Jays] to make a decision” in 2019, he said. Martin is owed $20MM next season, his last under contract, though he isn’t likely to receive more than a backup catcher or overall utilityman role since the Blue Jays are in rebuilding mode. Blair’s piece also includes the notable item that the Braves had interest in Martin last offseason while trying to find a trade partner for a Matt Kemp deal. Atlanta ended up sending Kemp to the Dodgers in a fascinating five-player trade that had major salary ramifications for both teams, and resulted in a big on-field impact as well in 2018, as Kemp enjoyed a comeback season and Charlie Culberson and Brandon McCarthy both contributed to the Braves’ NL East-winning campaign. Last winter, however, the Braves were simply trying to get Kemp off the books, and it’s interesting to wonder what type of “bad contract swap” could’ve been cooked up between the Braves and Jays, particularly with former Toronto GM Alex Anthopoulos running Atlanta’s front office. If Martin had ended up a Brave, he likely would’ve seen a lot more third base time this season, as the Braves already had Tyler Flowers and Kurt Suzuki as a very productive tandem behind the plate. Giles projects to be the Jays’ closer in 2019, though the bullpen as a whole will need some attention this offseason, Sportsnet.ca’s Ben Nicholson-Smith writes. Toronto is expected to look at adding veteran relievers in trades and free agency to bolster a unit that could face a heavy workload next season, given that the Jays will be planning on a young and inexperienced starting rotation. As well, veteran additions (as well as incumbent relievers like Giles) could also be turned into trade chips at the next July deadline, such as how the Jays have dealt the likes of Seunghwan Oh, Joe Smith, and John Axford over the last two years. Seven different players have started games at shortstop for the Blue Jays this season, with catcher Russell Martin being the latest (and most unusual) addition to that list on Saturday. With Troy Tulowitzki and Aledmys Diaz both on the DL, the Jays have been strapped for answers at short, Sportsnet.ca’s Ben Nicholson-Smith writes, as the likes of Yangervis Solarte, Martin, or Gio Urshela aren’t really suited to the position, while young shortstops like Richard Urena, Gift Ngoepe, or Lourdes Gurriel Jr. aren’t yet MLB-caliber hitters. Solarte might end up being the best short-term answer, provided that Devon Travis can regain any of his old hitting form as a regular second baseman. As for Martin, he has already expressed a willingness to see more time around the infield as a way of helping alleviate Toronto’s infield depth problems, and it isn’t out of the question that he’ll again make an appearance at shortstop given the Jays’ lack at the position. “Really, we don’t have a true shortstop on the team right now. Russell’s got good range, he’s got a good arm. He’s got everything. He’s got good hands,” manager John Gibbons said. Once Hanley Ramirez passes through the DFA process, Paul Sullivan of the Chicago Tribune argues that the White Sox should sign the veteran slugger as a short-term boost for the DH spot and for the lineup as a whole. Essentially, it would be a “what’s the worst that could happen?” signing for the team, Sullivan admits, and it may not necessarily make sense for a team that is prioritizing young players. I’d also add that if Chicago did sign Ramirez, he could potentially be flipped at the deadline or in August if he heats up at the plate. Massachusetts high schooler Mike Vasil has announced that he is attending the University Of Virginia this fall and has thus withdrawn his name from draft consideration, MLB Pipeline’s Jonathan Mayo reports (Twitter link). Vasil provided a fuller explanation of his decision on his own Twitter feed. The right-hander was a well-regarded member of this year’s draft class, with high placements on pre-draft rankings lists from MLB.com (which had Vasil 25th) and Baseball America (37th). He had already committed to Virginia, though it’s very common for high schoolers to forego college and begin their pro careers after being drafted. Orioles executive VP of baseball operations Dan Duquette said his team is “still taking a look at” whether or not to start trading veterans, as he discussed the Orioles’ status in a recent radio appearance on 670 The Score’s “Inside The Clubhouse” show (partial transcript provided by 670TheScore.com’s Bruce Levine, plus the audio link is included). While Duquette didn’t firmly indicate that a sell-off was coming, he did admit that “I am not sure we will be in that position” to consider adding pieces come Memorial Day, which is when the O’s and other teams usually take stock in their rosters. Russell Martin tells Sportsnet.ca’s Jeff Blair that he is willing to spend more time as an infielder in the latter stages of his career. “Whatever management thinks makes the team better, gives us a better chance to win. You know, the goal for me on any team I’ve played on is what’s best for the squad. And I’ve always been a fan of the infield,” Martin said. The Blue Jays catcher has 33 career appearances as a third baseman, four at second base, and one game each at shortstop and right field during his 13-year career, so he certainly provides more versatility than most backstops. Due to several Toronto infielders landing on the DL and backup catcher Luke Maile’s surprisingly hot bat, Martin has already made four appearances at third base this season. This positional flexibility could make Martin into a unique backup option in 2019 (the final year of his contract) or beyond, as well as providing Toronto with the means to give catching prospects Danny Jansen or Reese McGuire some quality playing time as early as this season. Though Jonny Venters has the service time to decline a minor league demotion, the southpaw agreed to a consent form that allows the Rays to send Venters to the minors during a 45-day window that began when he made the 25-man roster, Marc Topkin of the Tampa Bay Times reports. Since Venters’ contract was purchased on April 25, that 45-day period is up on June 8. With a 1.13 ERA over his first eight innings, it doesn’t seem Venters is a candidate for demotion, though the Rays’ unique deployment of their pitchers requires a lot of roster shuffling. Venters is in the midst of a remarkable comeback, returning to a big league mound for the first time since 2012 after his career was thought to be over following three Tommy John surgeries and another UCL procedure.